Draws a single point using the current pen. 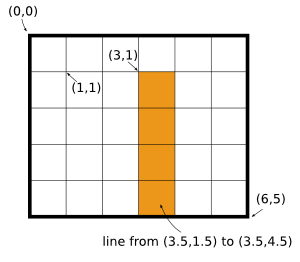 This is implemented by drawing a very short line, centered around the given position. To get the result of a single point, you should use a pen with a Wt::PenCapStyle::Square or Wt::PenCapStyle::Round pen cap style. AlignmentFlags is the logical OR of a horizontal and vertical alignment. Orientation::Horizontal alignment may be one of AlignmentFlag::Left, AlignmentFlag::Center, or AlignmentFlag::Right. Orientation::Vertical alignment is one of AlignmentFlag::Top, AlignmentFlag::Middle or AlignmentFlag::Bottom. TextFlag::WordWrap: using the TextFlag::WordWrap TextFlag is currently only supported by the SVG backend. The code generated by the SVG backend uses features currently only supported by Inkscape. Inkscape currently supports only Side::Top vertical alignments. Changes the font for subsequent text rendering. Note that only font sizes that are defined as an explicit size (see FontSize::FixedSize) will render correctly in all devices (SVG, VML, and HtmlCanvas). With the VML backend (IE), the shadow is not applied to images, and the shadow color is always StandardColor::Black; only the opacity (alpha) channel is taken into account.